If you would like information about becoming a sponsor, please contact us. Good things happen for our community with your sponsorship! Our name may be new to some in Washington, but you might recognize our faces, healing hands, and caring hearts. That’s because doctors, nurses, and other providers who are now part of Kaiser Permanente have been serving local neighborhoods for years. We’re glad to be here, and proud to provide the coordinated, connected care that helps our members and our communities thrive. Kaiser Permanente continues as perennial medical aid coordination and support for SpokeFest. My practice focuses on representing seriously injured bikers and families that have lost a loved one while cycling. I believe in preparing my cases for trial to put my clients in the strongest possible position to obtain the best possible result for their case, whether through settlement or trial. With 25 years of experience working in Spokane and around the world, we are deeply committed to our community, both the Inland Northwest region and the community of outdoor recreation. We participate in annual projects to clean our rivers, preserve our climbing areas, and ensure that the natural spaces we all love remain accessible to all. REI’s passion for the outdoors runs deep. Our core purpose is to inspire, educate and outfit people for a lifetime of outdoor adventure and stewardship. We believe kindness has the power to change the world. That’s why we are on a mission to make the world a little kinder, one act at a time. We call this the KIND Movement! Small act or big, we encourage it. We all have the potential to make a difference each and every day. Join us! Since 2001 Washington’s Maryhill Winery has been producing award winning wines. From Merlot to Chardonnay, Cabernet Franc to Cabernet Sauvignon. Articles and blogs about everything Outdoors in the region. Founded in 1972 as a factory-direct equipment company, BSN SPORTS is the largest distributor of team sports apparel and equipment in the United States. We are your ultimate teamwear outfitter of Nike, Under Armour and other national brands. BSN SPORTS is in the unique position to support the athlete and coach from grade school to college and beyond. We are the Best Supply Network in Sports. Get the best of what the Inland Northwest has to offer—every single day. We stand behind a proud tradition of developing unparalleled communities and building quality homes throughout the region. We have brought to life a vision of a small-town neighborhood feel—connecting people of all ages and walks of life—without compromising on access to the shopping, dining, services, entertainment and outdoor recreation that you enjoy. For every stage of life, there is a home for you at Greenstone. We have provided website support for all ten SpokeFests. At Roast House, our business and our coffee is first and foremost about relationships ï¿½ with the farmers who grow the beans, the retailers and restaurants that serve it, the coffee lovers who consume it, the communities and values each of those entities represent ï¿½ and a world that is struggling to find better solutions and new ways of doing business in the face of social, political, economic and environmental uncertainty. The mission of Spokane Public Radio stations KPBX 91.1, KSFC 91.9, and KPBZ 90.3 is to provide high-quality, artistic, educational, and informational programming, which enhances and enlivens the cultural life and civic discourse of its listening communities. We are unique in our offering of banking and financial services: regionally close for our clients, convenient access to our experts, yet large enough to offer a full suite of sophisticated financial services typically found in national banks. We help individuals, organizations and businesses reach their financial goals by offering all the products and services required from one financial partner. Wheel Sport is a family owned and operated bicycle sales and service company with 3 locations in the Spokane area. Open since 1972, we are committed to the highest possible customer service experience and professional, timely repairs. The shop has been voted the Inland Northwest’s #1 bike shop for 15 years by local riders, and is one of the Top 100 Shops in the country, according to Bicycle Retailer magazine. We offer the best in bicycles, apparel, service, and Body Geometry Fit bike fitting procedures. Locations Downtown Spokane, in the Spokane Valley, South Perry, and on the Web. Come visit us. Rosauers has continued to stand on its founding principles of providing the highest quality products, largest selection, cleanest stores and friendliest, professional service. Rosauers commitment to valuing its employees and customers will continue to guide the company toward a very successful future. Mert Rosauer would be proud of the legacy he founded so many years ago. Here at Charlie’s Produce, our goal is to develop long term partnerships with our customers. We achieve this by getting to know your specific needs and expectations, and by keeping you updated with the latest products, trends, and market conditions. In any economy, organizations look to their accounting and consulting firm for active, engaged guidance. We get that. That’s why nothing’s more important to us than anticipating your needs and proactively addressing them. For over 30 years in Spokane, our commitment to “consistently deliver a quality repair that meets the customers expectations” has created a reputation for excellence in the community. It’s our privilege to serve you with the best trained, most professional service in auto repair, vehicle maintenance and related auto services. Northern Capital Management, Inc. and Capital Retirement Plan Services, Inc. are fee-based, registered investment advisors serving individuals, families, pension plan trustees and participants throughout the country. Come Ride With Us! 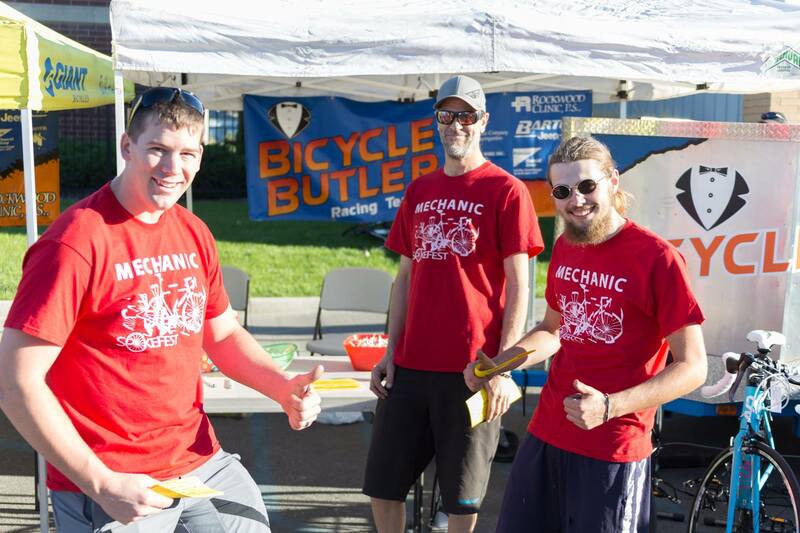 Spokane Bicycle Club has been serving the cycling community in the Spokane region since 1985. We are a recreational club offering multiple scheduled group rides each week, March through November. Our rides are designed to meet the needs of bicyclists new to group riding to cyclists interested in pushing the fitness envelope for personal best performance. The Spokane Mountaineers is an organization devoted to the conservation and enjoyment of the out-of-doors. By joining the Mountaineers, you have chosen to adopt these principles for your own and become a participant in some of the most exciting and enjoyable activities available in the Pacific Northwest. Welcome to the Bicycle Butler! Our shop is owned and operated for riders by riders! We have an open air service department where you can watch us work on your bike!! We often receive visits from our fellow customers and friends just to shoot the breeze and talk about their latest and greatest rides. Come and visit Bicycle Butler for new and used bikes, cycling accessories, clothing, just a chat and for absolutely unbelievable service! If you bike, experience the Butler, it’s the only shop you’ll ever need!! Mojo Cyclery is a full service bicycle shop specializing in bike repair, fits, and sales located in Spokane Valley, Washington. Owner operator, Morgan Johnson, has nearly 15 years in the bicycle industry with an extensive background in triathlons and road racing. ​ Here at Mojo Cyclery, we are committed to giving you the best bike shop experience possible, whether it is getting you ready for next event or helping you find your next dream bike. North Division Bicycle Shop received the Smart Shop Award from the League of American Bicyclists. The League chose national winners on the basis of efforts to promote bicycling in the community, bring newcomers to biking, and to teach bicycle safety.